This post comes to us from strings enthusiast and middle school teacher Marcelle Good, who works at School of the Future (Brooklyn, NY) and is a Math for America (MfA) Master Teacher. My 6th graders love to skip count. If you were to ask them whether, for example, 6 was a factor of 96, many would be willing to skip count (by sixes) all the way to 96. Even if they don’t find this tedious and inefficient, I do. So I’ve been working this week on generating some faster strategies for finding factors of numbers — also known as divisibility rules. We started with a lesson on “benchmark factors” — easy numbers to count by. We talked through 2, 3, 5 and 10 as great places to start and generated some good ways to determine if those numbers were factors of a number and also finding the factors that paired with our benchmark factors. But we got stuck again in trying to figure out less obvious factors. Determining if 7 was a factor of, say, 92 was a daunting task. A few of my students were pretty good at finding a “friendly multiples” and skip counting from there. So this idea became the basis for this year’s first number string. Is 6 a factor of 60? Is 6 a factor of 66? What about 6 as a factor of 72? And what about 6 as a factor of 80? I modeled students’ thinking on the number line — because this model is something we’ll use a lot in our later strings. And I want them to get a lot more comfortable with them seeing their thinking on a number line. Luckily, students recalled the facts 6 x 10 and 6 x 11 and used those to help them, but when the numbers were larger than the facts they knew (6 x 12) they jumped to a landmark and then use their skip counting by sixes again. Is 7 a factor of 77? Is 7 a factor of 84? When I posed 7 as a factor of 84 a student mentioned that this is really like asking, “Does 84 divided by 7 have a remainder?” That’s great, because it suggested that my students were beginning to connect skip counting, to factors, to multiplication and even division. During turn and talks, most of my students were breezing through the questions and finding strategies to answer the questions. Is 7 a factor of 91? When I asked if 7 was a factor of 91, though, they were much less confident, and several of them jumped to “no” very quickly. Part of that was because I used a fact (7 x 13) that was not well known to students — it was just beyond the facts they had automatized. So they really had to use what they already knew about the multiples of 7. 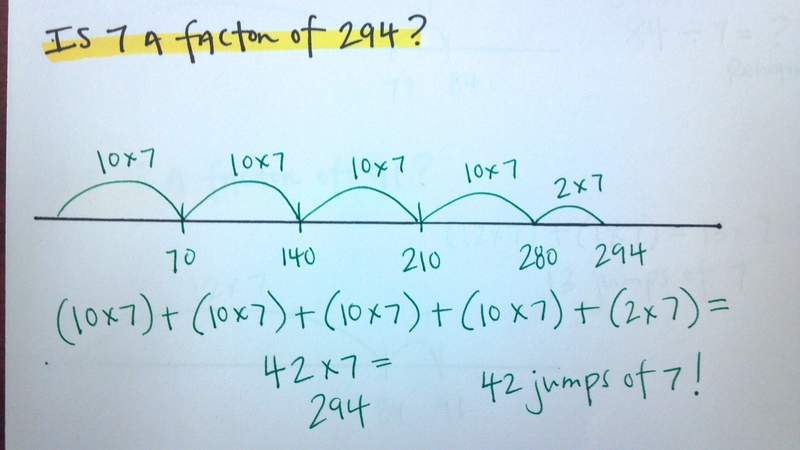 Luckily, a few students explained that if we knew that 7 x 12 was 84, we would need just one more jump of 7 to get to 91. Is 8 a factor of 96? And here the strategy of partial products came up again. Eleven jumps or groups of 8 gets us to 88, and then we need just one more jump. So 12 jumps of 8 gets us to 96. I modeled this thinking on the number line. 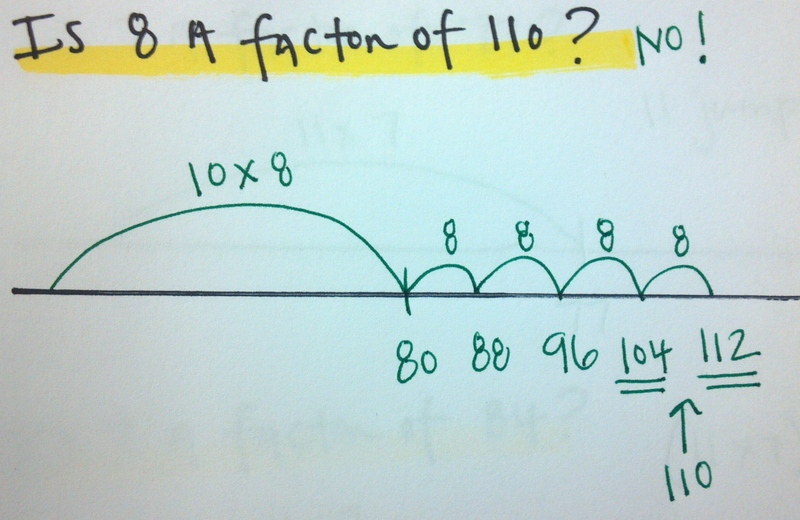 Is 8 a factor of 110? This problem did not pose a problem — they came to a pretty fast “no” based on skip counting from either 80, 88, or 96. Is 7 a factor of 294? Is 7 a factor of 294? was daunting and took some puzzling. To support them, I asked, “Where can we start counting from? What number will help us?” Starting from 70 was a comfortable place for my students, and that got us thinking through how to use that to help us get closer to 294. Getting at the idea of “where do we start this?” elicited some good strategy conversations — helping kids use partial products (like 7 x 10 and 7 x 5) instead of skip counting the entire way to 294. I’m excited to take this work and use these strategies with some small groups of 6th graders who are still working on building automaticity with single-digit multiplication. Thinking about “friendly multiples” is such a game changer in multiplication and is definitely going to make my class stronger with factors. Marcelle had to make several in-the-moment decisions about how to model students’ thinking with this string. In the first problem the students might have thought about the situation quotatively — how many jumps of six will it take me to get to 60? — or partitively — if 60 is enough for exactly 6 jumps, how big is each jump? Ideally, we want students to be flexible enough to use both and we need to represent their thinking accordingly. That the string proceeded in a quotative way (10 jumps of 6) also had implications for her multiplication notation. If there are 10 jumps of 6 to get to 60, she wrote 10 x 6 and not 6 x 10. This is consistent with the idea in multiplication that the first factor typically describes the number of groups and the second factor describes the number in a group. 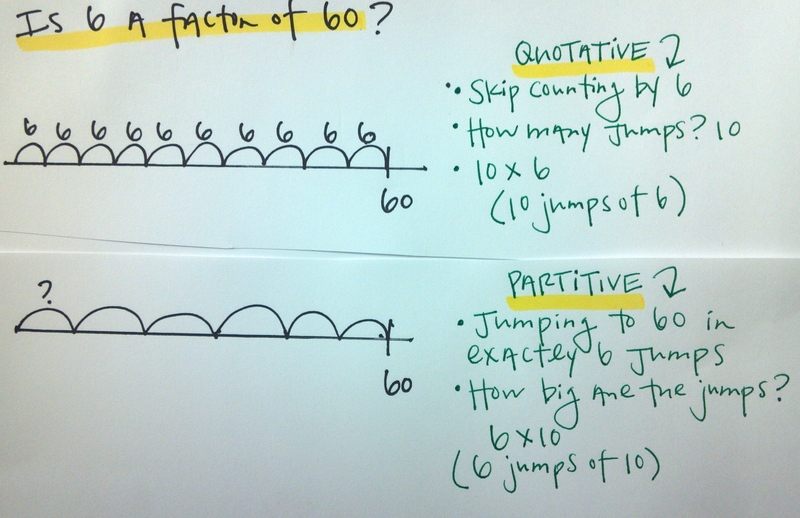 So 10 jumps of 6 becomes 10 x 6 for her students.